New member - This Forum is brought to you by The Mastiff Sweet Spot and Friends of the Forum. Hi everyone! My name is Ashley and I'm new to this forum! 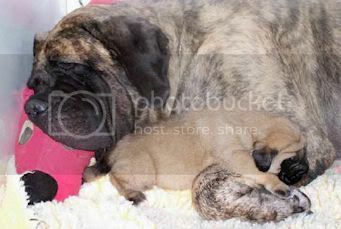 I have a male English mastiff named Reggie who just tuned one on march 4th! He is my first English mastiff, and I don't think I would ever be able to own a different breed again!! He is literally like my second child, and a HUGE mommas boy. He is constantly by my side and even though he is already over 200lbs, I don't have the heart to tell him that he's too big to be a lap dog lol. I have never had a dog so affectionate, loving and loyal in my life! And he is AMAZING with my 8yr old son. I couldn't be happier to have him be a part of my family! Welcome to the forum.. looks like you have discovered the wonderful temperament of our breed. Now you know why we are all so devoted to them..they are wonderful. Nice looking boy, but what we really care about is the temperament you describe. This is just what we want, and when we have it, it makes the Mastiff the best of dogs.